I woke up this morning to a tsunami warning after one of the largest quake ever recorded hit the coast of Chile last night. So I figured it was a good morning for a couple shots of Bailey’s Irish Cream with my morning coffee. 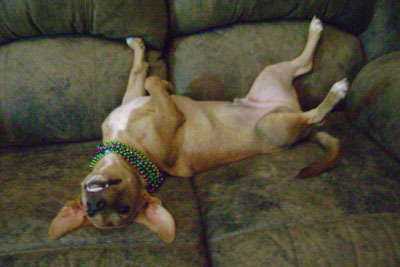 I warned my neighbors without tv, put all my animals in a safe place and am just waiting for this to pass. I talked to a couple guys late last night and most saw lots of fish yesterday, a couple guys released 6 or 7 sails and saw 10. The guys on the 28′ Carolina Classic went 2 for 7 on sails yesterday. It seems like guys are seeing fish but they are still biting strange. My buddy on the 32′ Irwin Forbes went 3 for 10 yesterday. Captain Jorge on the 28′ center console raised 7 and released 2 today and the guys on the 28′ Carolina Classic went 3 for 6 yesterday. I think everyone caught at least one mahi mahi as well. The case of lock jaw seems to continue but the fish are out there…so they have to bite sometime. The first report I received today sounded good. The guys on the 32′ irwin Forbes raised 10 fish including 2 marlin…the fish were biting wierd so they only ended up with 3 sailfish releases. The big marlin just came and went. They fished about 25 miles down south. Above are a few pics that some of our readers and friends sent in. I had a group contact me a few days ago and told me they needed a 50′ boat for 2 days offshore. They said they are upscale customers and wanted something really nice. I told them there were a couple big, old, smokey, slow, crappy charter boats in the charter dock but I wouldn’t put my people on one of them. I told them I would check on other options. Within 24 hours I had found them a newer 60′ Bertram, fast boat, American owned and operated, direct tv, great crew and quality tackle for $2500 per day with 2 days booked. They told me they had already booked a boat. I said no problem and ask them who they are fishing with. They gave me the name that I won’t mention and they got fooled into reserving one of those big, old, smokey, crappy, slow boats that I warned them about…they paid $2500 per day for a piece of crap. A boat with motor problems, electrical problem and 20 year old shag carpeting that smells like puke and stale beer. The guys that sold the charter should be ashamed for putting anyone on that boat. More than likely they will not have a good time, they will not like that boat and they will not have a good fishing experience in Costa Rica. We are all about repeat and referral business and we will put you on the best boat for your budget. 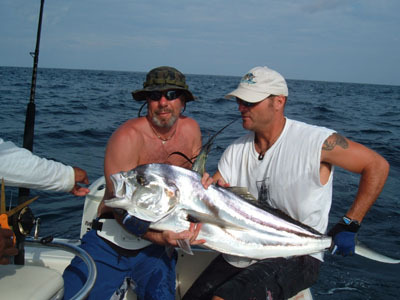 So even if you don’t catch many fish you will still have a quality experience fishing Costa Rica. Don’t trust everything you see on the Internet. The fishing the past few days out of Los Suenos has been good but not great. 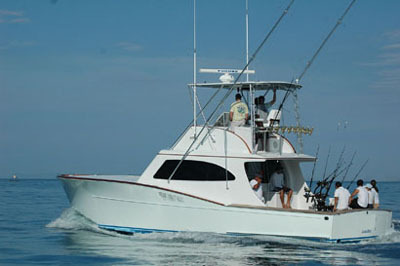 Most of the boats are getting anywhere fron 2 to 6 sailfish per day as well as a mahi mahi or two. Most of the captains I talk to agree that the fish are out there…they also say that there are more skipjack out there than the have ever seen. The sails seem to have lock jaw…maybe there is just too much bait in the water and they are full on skippy’s. The guys on the 42 Maverick released 5 sailfish and kept a big mahi mahi for dinner. The anglers were from Bermuda…a place on my bucket list to fish. The 32′ Irwin Forbes had a half day trip and went 15 miles out and went 2 for 3 on sailfish and they also caught a nice dorado. A couple 28′ center consoles went out and one group caught 2 sailfish and a nice mahi and the other group caught 3 sailfish. Congrats to the private boat The Big Oh for winning the 2nd leg and series title in this years Los Suenos Signature Billfish Series. 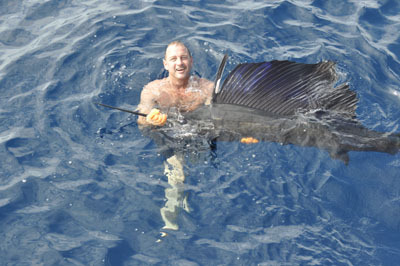 They released 22 sailfish in the 3 day tourney. The same weather front that ruined my tarpon fishing wreaked havoc on the first day of the tourney. Almost a dozen boats got caught too far offshore and where not able to make it home by the afternoon deadline because of unusually rough seas. Through a series of very unusual events one of the best boats in the charter dock has come open from March 22 to March 30. This newer 42′ is a beautiful boat with quality equipment, air conditioning and one of the best captaina nd crews in the marina. I hve fished with these guys dozens of times and they are top notch. They are normally $1750 per day…now just $1650 if you pay cash. Contact me asap if you are interested…these days will book fast. 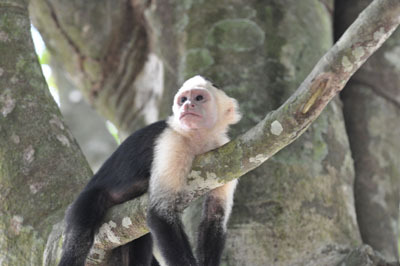 I just returned from a couple days fishing on the Caribbean side of Costa Rica and unfortunately it was a wash out. A cold front moved in the afternoon we arrived and the next morning it started raining at 7 am and never let up. It was cold and windy with hard rain. It was like some sort of bizarre water torture with sandwiches and beer. We rode about 20 miles up to north in the canals and tried to get out of the Barra Colorado but it was too rough, we tried fishing the river mouth but the cold front, rain and muddy water made for tough fishing. Day two was better weather…it was cloudy with no rain. 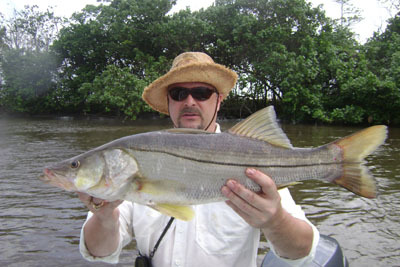 My buddy from back home caught a nice 10 pound snook but that was about it. The water levels were way up and the hard rain had made the river a muddy mess. We ate the snook for dinner…the chef at the lodge deep fried some and baked some and it was delicious. The tarpon fishing in this area is legendary…it’s not uncommon to get 10 tarpon a day when the bite is good. Unfortunately…the weather here is also legendary. September, October, March and April are usually the best weather months…the other times of the year weather can be a factor. The fishing was a wash out but everything else was great. Captain Eddie is a great guy and really tried to get us on the fish. The lodge was very nice with comfortable rooms, a lot of gourmet food, great service and a cool bar overlooking the river. I am getting unpacked and hopefully will get caught up on emails and will post the results for the fishing tourney this past weekend. 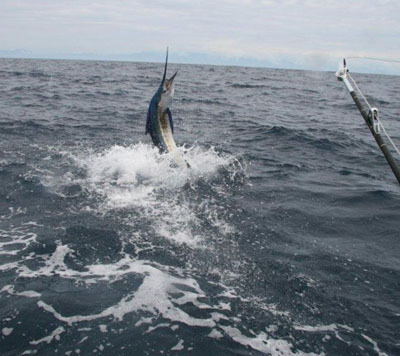 The 2nd leg of the Los Suenos Billfish tournament starts tomorrow and everyone is being hush hush about the bite. The sailfish bite has been hit or miss this last week and there have been very few marlin around. Most guys I have talked to have been getting anywhere from 3 to 6 sailfish per day and a mahi mahi or two. I have company in from back home in Nebraska and we went out yesterday on a new 43′ in Quepos. We had a really good day going 9 for 11 on sailfish. We had 3 double hook ups and releases. We caught most of the fish using live bait and that’s a fun way to fish for the big boys when the conditions allow. The boat was brand new and very nice, the captain and crew were great guys and hard workers, the food was good and the beers were ice cold…my friends from Nebraska had a great time. I am leaving this morning to go over an fish the Caribbean side for 3 days for tarpon and snook…I hope the weather holds out. I will have email access over there and I will be in contact every evening. My assistant Martha helps organize a Mardi Gras in our town of Esterillos Oeste on the central Pacific coast. This is the second year and they had a parade with motorcycles, floats, bands, ect. They throw beads and candy to all the local kids that line the parade route. 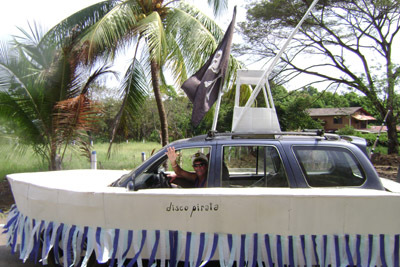 This year one of my many dogs got some beads and one of my neighbors built a float replica of my boat the Disco Pirate. I have taken him out for some fun fishing and he loved it… I think this is his way of trying to secure more fishing trips in the future. The first reports I heard today were not very good. The water was a little rougher than usual and the sailfish bite was slow…it even looks like we are going to get some rain tonight…weird weather for February in Costa Rica but I guess this was a weird weather week all over. One of my best fruiends is coming into town tonight and we are fishing tomorrow on our boat and then Tuesday in Quepos on a brand new 43′ Maverick with the guys that just won the Harry Grey fly fishing tourney…and then we are heading to the Caribbean side for 3 days of tarpon fishing with the most famous tarpon guide in CR. I sure hope the bite heats up. Today was a strange day offshore…some guys that got out really early had 10 to 15 sailfish bites and then it slowed down in the afternoon. My buddies went out in our boat while i was working like a rented mule all day and they raised 4 sails and 2 mahi mahi before noon and they were just 15 miles out. 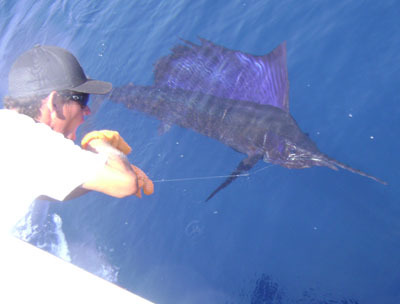 The guys on the 38′ Custom had a slow morning and then raised 6 sailfish in the afternoon. the captain said the fish were being lazy biters. It sounded like the hot bite way out slowed for most boats today…most boats were 5 or 6 fish instead of 10 to 12 fish. 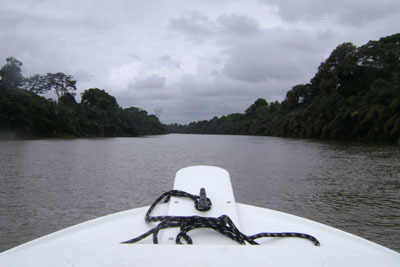 You are currently browsing the Costa Rica Fishing Reports blog archives for February, 2010.